Not only is the Earth HOLLOW, but it is inhabited by Advanced Civilizations! Read about the existence of these evolved civilizations that live in peace and brotherhood in the Center of our Earth, which is HOLLOW, and contains an Inner Central Sun, with oceans and mountains still in their pristine state. Discover the Lost Library of Alexandria! 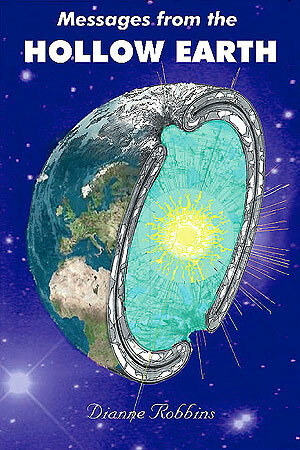 Greetings from the Hollow Earth! I am Mikos and I dwell inside your Earth. I am reaching up to you in consciousness, to impart our frequency to you as you read the words on these pages of our book. These pages are sacred, for its content contains the mighty power to change the world - if but enough surface folk read them. This is our purpose for dictating our messages to you. It is to hasten change on the surface so that people will once again be connected to their divine self and source of inner guidance. us directly as your eyes perceive our words. We await the great day when we will be able to show ourselves to you, when you will be able to peer directly into our eyes and fathom the God within our souls - including yours. Many are now still separated from the Lord God I AM of their being, but our purpose for these messages is to bring you the reality of your own God Selves and help you connect to the Light within your own soul. Life is about connecting - not disconnecting into separate units, as your density and negativity and limitation on the surface caused you to do. Life is a flow of energy, connecting everyone, everywhere, simultaneously. We invite you to be in this flow, and flow with our thoughts and our heartbeat as you read our words carried to the surface on the winds of telepathy - winds that bring our thoughts and feelings into your heartspace - for you to also access as you learn to resonate with our vibration. As you think of Us, you will feel a heightened sense of being as our energy cascades into you. It is a physical sensation that is unmistakable. Move into it - for it is Us - making contact with you - consciousness contact - and it feels like energy currents flowing through you, currents of heightened sensitivity and divine bliss, putting you into a protected space of peace during our connection, that lingers about you for the remaining day. We offer you this, as a gift freely given as you read our words. We've been calling to you for so long, and now through this book to the world, you are hearing us. We are joyously anticipating your heart contact and are ready and eager to respond to your thoughts. So tune into us, sit quietly, and feel our vibration engulf your physical body and raise your energy field. We wait for your call." "MESSAGES FROM THE HOLLOW EARTH"
Dictated to Dianne Robbins by "Mikos" Reviewed by BRANTON (BRuce AlaN WalTON), Hollow Earth Researcher. Unlike our Internet, Porthologos has a Psi-net much like the virtual-reality chairs and helmets that you see in the movies. However it is not "virtual" reality, but "true" reality, as the Psi-net takes you through the virtual galactic info-net to explore other worlds and dimensions with your thoughts AND feelings. Or, you may experience the crystalline recordings of all the recorded history of our Omniverse, if you wish. "MESSAGES FROM THE HOLLOW EARTH" is a must-read, if one is interested in knowing the truth about this strange and wonderful world in which we live, a world that plays such a central role in the history and destiny of the human race in this grand universe." virginal, car sur leur sol, ils n’y marchent ni ne construisent. d’eau, rivières et océans et lorsqu’ils escaladent les montagnes. des reflets du Soleil Central Interne qui irradie depuis le centre. 643 kilomètres, sous la surface. un incendie en 642 après J.C.
garder en équilibre l’écosystème des formes de vie qui y résident. 36.000 humains de la surface vivent à l’intérieur de la Terre. und fragte mich, ob ich seine Botschaften annehmen würde. verbinden uns augenblicklich mit an wen auch immer wir denken. Der Ruf ergeht aus der Hohlen Erde und den Unterirdischen Städten. in diesem weitläufigen und sich ausdehnenden Universum ist. gelesen habe, sind in Kapitel 24 zu finden. nur langen, langen Tageszeiten und keiner Nacht. in ihrem ursprünglich reinen Zustand sind. weil sie auf ihrem Land nicht umhergehen oder darauf bauen. Es gibt keine Gebäude, keine Einkaufszentren oder Schnellstraßen. auch das Land der Natur. und die ihnen alle Energie liefert, die benötigt wird. und befindet sich folglich also ca. 400 Meilen unterhalb der Oberfläche. hinter dem Magnetfeld der Erde. stattfinden können. Nur ein paar davon sind gegenwärtig offen. die Öffnungen vor Sichtungen aus der Luft und vom Land aus geschützt.